This cooks through surprisingly quickly using a kettle barbecue in which the heat is trapped around the fish. You’ll need to allow a little extra cooking time if using a regular barbecue. 1. Preheat the oven to 180oC, gas mark 4. Scatter the lime in a small roasting tin with the fennel. Drizzle with wine or stock and cover tightly with foil. Bake for 40 minutes until the lime slices are tender. Leave to cool. 2. Place one salmon fillet, skin side down and scatter the fennel and lime on top. Sprinkle with the salad onions, dill and a little seasoning. 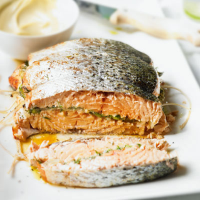 Drizzle with the honey and arrange the second salmon fillet on top, skin side up. Tie at 3cm intervals with string. Brush a large sheet of foil with the oil and use to wrap the salmon. 3. Light the barbecue about 30 minutes before cooking to allow the flames to die down. Place the foil-wrapped salmon on the barbecue and cook for 10–15 minutes on each side (or if weather is bad cook in the oven for 40 minutes). Unwrap and push a sharp knife into the thickest area of one fillet to check that the fish is cooked through. If necessary re-wrap and cook a little longer. Transfer to a plate or board, remove the string and serve in thick slices with mayonnaise.